YPD, Yarmouth Pantry, and volunteers join forces for annual food drive. Spirits were high on this beautiful December day as volunteers gathered for this annual food drive. The Yarmouth Police Department, Yarmouth Food Pantry, Yarmouth Police Relief Association and the Yarmouth Police International Brotherhood of Police Officers Local 422 coordinated this event at 3 local supermarkets. The Pantry serves over 800 families, or 1700 people, over 30% of which are children. Over 80 volunteers help staff their year-round programs. Below we see Officer Diana Wells with volunteers at the Station Ave. Stop & Shop. A van was being loaded with many donations as Officer Wells spoke with shoppers. The community support for this program is inspiring. Below we see Officers David Dickie and Melissa Alden with Pantry President Elena Schuck and a volunteer at Stop& Shop on Long Pond Drive in South Yarmouth. Below: Pantry President Elena Schuck with a dedicated volunteer, Stop & Shop, Long Pond Drive. Below we see Officer Gordon Gibbons with Pantry volunteers at Shaw's, Route 28. The need for donations and volunteers is continuous and growing. For more information on the Yarmouth Pantry go to their website. South Yarmouth site sports some interesting views. It seemed important to get out for some fresh air before the storm, amid the surety of today's cabin fever. I wanted to share some photos from South Yarmouth's Flax Pond. The water level at Flax Pond is so low these days that it is possible to walk the circumference of the pond. What few may be aware of is a cedar swamp adjacent to Flax Pond. It is a little hard to get to, but just as scenic as the ones on the outer-cape. I'd like to share some photos from the area. Enjoy! Interesting teepee in cedar swamp. Group effort revitalizes the Amphitheatre. 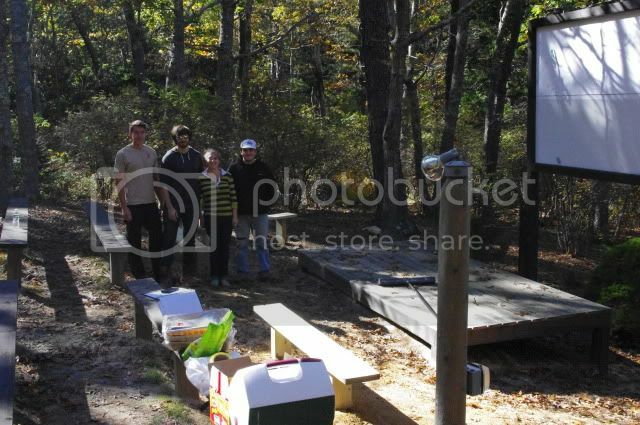 Nickerson State Park's Amphitheatre is getting a facelift, thanks to the efforts of some Eagle Scouts from Troop 77, Brewster. Led by Eagle Scout Brian Chin, above left, this group is making some meaningful improvements at the site. Eagle Scout Tim Couto and Eagle Scout Candidate Nick Couto joined Brian and other volunteers in this effort. It all started when Brian approached the Friends of Nickerson State Park. asking them to identify a spot that could be improved. With the help of the "Friend's", Hinckley Home Center, volunteers and donations, several improvements are slated for the site. New benches have been installed. Lighting was replaced to remediate recent vandalism. The benches and stage will be stained/painted to properly seal them from the elements. A washed-out center aisle will be given new gravel and some steps for safety. We applaud the community-oriented eforts of these Scouts. They are performing very necessary improvements in a spot enjoyed by many. Great job, Brian, Tim, Nick and Troop 77! I'd like to share some recent photographs, spanning from Brewster to Boston. My studies have been carrying me towards the city, but I still find rare moments to hike this lovely peninsula. Enjoy! Last Wednesday, the fog was thick as we approached Boston. The expressway was murky and the buildings were shrouded in deep gray. Here is the view from the expressway. Photos and video by Jonathan Mayo. It was nice to get break from rain this afternoon, and the opportunity to see a sunset at Scargo tower. The skies were ablaze! Enjoy! Amazing end to an amazing day. Many of you may have seen this wonder spanning the Cape this afternoon.DToday was an amzing day weather-wise and this double rainbow was a blessing. A Great Blue heron stand guard at Indian Lands, Dennis. A somber sky frames Route 6 at Bass River. A group of cormorants perch on wires above Bass River. Reflections of a Summer's End. I'd like to take a moment to share some recent photos, as summer's lease hath all too short a date, and the realities of school's return ring as much for me as they do for my kids. I've had some fun exploring areas of Dennis, Harwich and Brewster during rare moments of leisure. Here are some shots from "far afield"
A water hyacinth dominates the landscape in Harwich. Reflections of leaf and sky, Niickerson State Park. Deer tracks at watering hole, Harwich. Dennis, looking towards Setucket from Flax Pond. Brewster is for the birds! Deep in the woods of Nickerson State Park I spotted this playful, yet dutiful Downy Woodpecker. I appreciate the poses, little one!